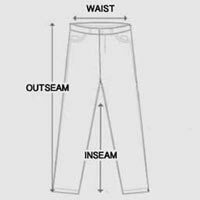 Slim Fit Designer Trousers Homme by Dole Rafi. Be the first to indulge in Dole Rafi’s spring collection in the limited edition slim fit designer trousers. Designed with a lightweight material with slight stretch and comfortable elastic waistband. The slim fit designer trousers are constructed with black zipper pockets on the sides and dual faux pockets on the rear with flaps and flat button closure. The fragmented black stripes are a unique twist to the classic pinstriped trousers. Fashioned with a slim fit for an exceptionally tailored look. Be seen in Dole Rafi’s slim fit designer trousers perfect for your springtime affairs.